Corona treating systems modify the surface characteristics of substrates for best results in printing, coating or laminating processes. Corona treatment results in a controlled increase in surface energy of treated substrates with significant improvement in their wet ability and adhesion. Dynaspede, manufacturers of Corona treating systems for Converting, Plastics, Label and Packaging industries, also provides 3-D surface treaters and plasma treaters. Dynaspede brings to you solutions for your static electricity related problems from Julie Industries, USA. Static electricity can drag productivity down. It attracts dirt causing jamming, fire hazards, uncomfortable shocks, quality problems and rejects. Static Control Brush:The conductive static brush gives the static charge a path to the ground. When a charge is generated on a surface such as plastic film, a well grounded static brush mounted very close or touching the film minimises the charge by sending it to the ground. 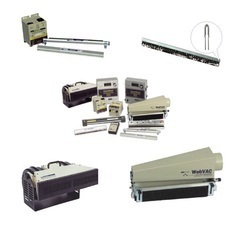 Static Neutralising Bar:The "shockless" static neutralising bar, in conjunction with the power supply, is designed to help you control the static electricity that results from contact and separation between two surfaces in the manufacturing environment. Ionising Blower:This extended range ionising blower is designed to effectively cover a wide area with an electrically balanced ion stream. 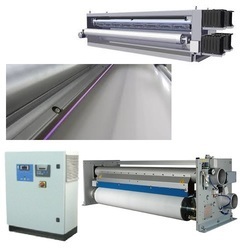 Web Cleaning System:This innovative narrow-web cleaning system is designed to provide either contact or non-contact continuous cleaning of narrow web in a variety of critical applications. It combines powerful vacuum, static neutralisation and compressed air blow-off to provide effective cleaning.